Seahawks Schedule – Go Hawks! 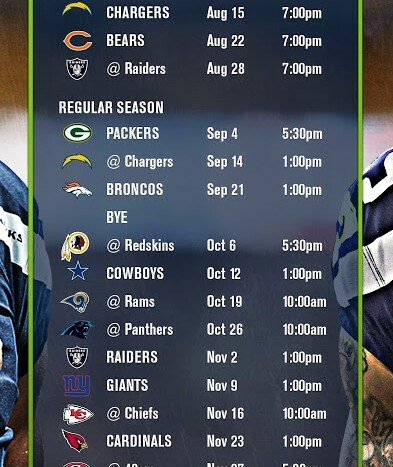 Since today is the first game of the Seahawks regular season and Seahawks excitement has reached a fevered pitch, we thought it was appropriate to send out this season’s schedule to you all so you have it at your fingertips. We will be watching tonight’s season opener in Pioneer Square at McCoy’s Firehouse, maybe we will see some of you down there!